At the time the goal was set, the polio virus was endemic in 125 countries and about 350,000 people, mostly children, were paralyzed by polio each year. It was an audacious goal – but 24 years later, the number of polio cases worldwide had fallen by more than 99 percent, saving more than 10 million children from paralysis. The near-eradication of polio took big public investment in vaccine. Polio is highly infectious, and entire villages and districts had to be vaccinated to stop the chain of transmission. Stamping it out meant recruiting and training hundreds of thousands of vaccinators and sending them into the field with millions of doses of vaccine, which had to be kept cold in foam-plastic boxes. The goal was to vaccinate every child in the country several times, with a month or so between each round. It was this kind of unprecedented effort that allowed India to declare itself polio-free in February 2012. 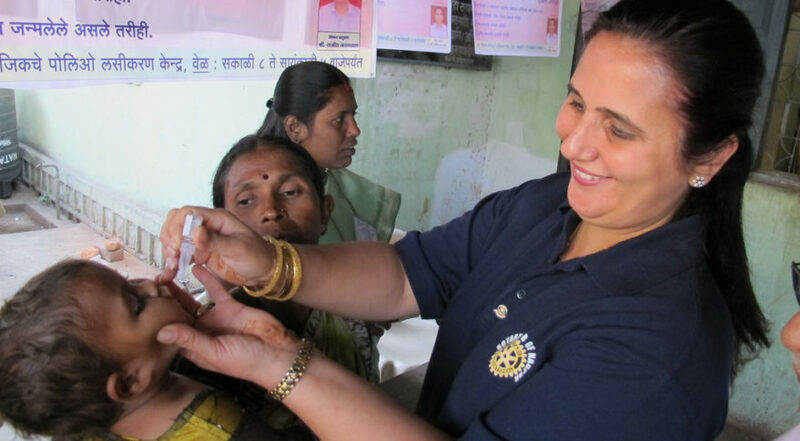 India was long considered one of the most unlikely places to eradicate polio, because of its high population density, high rates of migration, poor sanitation, and low rates of route immunization. But data-driven planning, well-trained and motivated staff, rigorous monitoring and political will at all levels made the difference. So did satellite technology. According to Bill Gates, whose Gates Foundation is funding the battle against polio in nations around the world, satellite imagery and mobile phones equipped with GPS are instrumental in the fight. India is now sharing its best practices with Nigeria, Afghanistan and Pakistan – countries where polio remains endemic – and the Nigerian experience shows just how technology can help a person-to-person effort achieve national scale. Satellite technologies feed into many steps in the process. Space-based imaging is used to update geographical information systems (GIS) that generate maps for the field workers. Using GIS as a tool, supervisors plan how to deploy their teams in order to cover every village and settlement. Each morning, the teams receive their GPS-equipped phones and start their visits. In the villages, with the help of local guides, they visit health facilities, schools, markets and mosques, where they vaccinate both children and adults. At the end of the day, the phones are collected for charging, which lets supervisors download their tracking data and match it to the GIS system. The results are tracks showing where every vaccinator has been as well as updated map coordinates for important buildings. Every few days, the teams receive summaries of missed or partially-covered settlements that need a return visit. As impressive as this effort has been, the battle is not yet won. The 2012 World Health Assembly declared that the complete eradication of polio was “an emergency for global public health.” That is because the disease is making a comeback in nations where civil unrest and war are making it impossible for vaccination programs to function. But it is a battle worth fighting. In addition to the relief of human suffering, experts believe that eradicating polio will generate US$40 to $50 billion in benefits, with most of it going to low-income countries. Winning that prize is a cause to which the satellite business is proud to contribute.